Did you notice this when installing InsertLearning? You gave our extension permission to "read and change all your data on the websites you visit". Wow, that can be a little scary and a number of educators and students have emailed us asking WHY do you need such a powerful ability and WHAT are we doing with that information. InsertLearning works by adding a "layer" of information on top of webpages. Once the webpage loads, the IL extension then modifies the page content by inserting questions, discussions, notes, and annotations. We call that the "lesson layer". We save the content and location of each item in your lesson layer. We don't save content from the website itself. Are we reading every website you visit? No. InsertLearning only accesses information on sites you load the IL extension. Does IL have access to my passwords and browsing history? No. We do not access your saved passwords or browsing history. If you are signed into a 3rd party site to access content we do not look at your login information. All IL needs to work properly is your Google ID and the page URL to identify which "layer" we need to display on the page for you. Why do you need my Google ID? We use Google Sign in to handle user accounts. We chose Google because the majority of schools in the USA provide google accounts for their students, even if email is disabled for the account. This accounts easier to setup and more secure because you don't need an email to verify your account, no extra password to forget, and controlled by your school admin. We do store your Google ID but never see your password or other log in credentials. Google handles all of that and simply tells us your Google ID when you have successfully signed in. 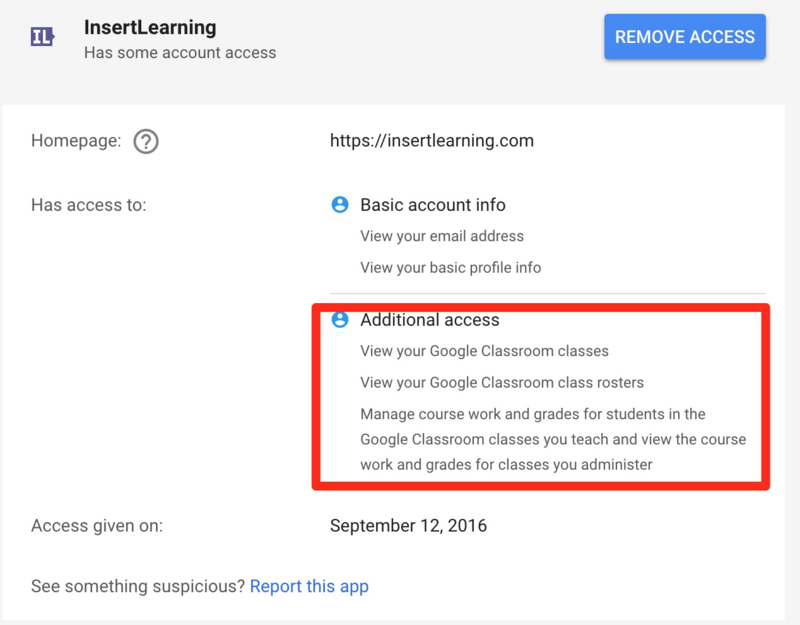 If you use Google Classroom with IL then you granted InsertLearning additional permissions to view your classes, roster, and manage coursework/grades. That last one of managing your courses and grades can be a little concerning just like accessing the pages you visit. InsertLearning needs permission to access manage course work and grades so that we can post assignments to Google Classroom when you do this through our service. You can also send IL lesson grades directly to Google Classroom so we require permission to modify grades. We do not modify or use assignments and grades not connected with InsertLearning. Want to learn what tools have access to your browser and Google account? Can I disable or uninstall the IL Chrome extension? Yes. If you are still concerned about your data privacy (and who isn't these days) and do NOT want the possibility of IL being active on pages you access you can disable our chrome extension or uninstall it completely. Disabling the extension is something that Chrome handles and we have no control over. It completely turns off the IL extension and can only be re-enabled by you.